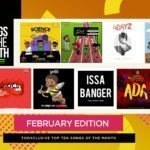 The TooXclusive top 5 weekly music countdown series continues, and this is week 10 in the year 2018. Wizkid and his Starboy crew have usurped the #1 spot for this week on the music countdown. The hot and trending song, Soco has succeeded in displacing Olamide‘s Science Student, which enjoyed the peak position unrivaled for over 6 weeks now. Joining the playlist this week is the soulful symphony of Adekunle Gold‘s IRE. 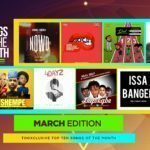 The list also recognizes musical duo, HYPA for their latest release, Dance, while DJ Enimoney‘s Diet (feat. Slimcase, Reminisce & Tiwa Savage) and the trio collabo of D’Banj/Slimcase/Mr Real on Issa Banger hold sway. 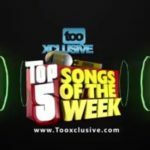 “Wizkid “Soco” HYPA “Dance” Adekunle Gold “IRE” – Top 5 Songs Of The Week #10″, 5 out of 5 based on 1 ratings.